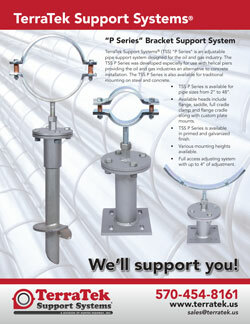 Pipe support brackets designed for helical piers and mounting on steel and concrete. 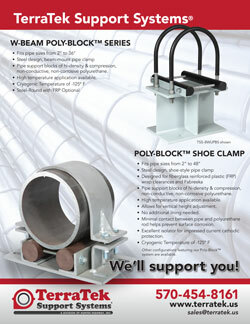 Pipe clamp systems designed for helical piers and mounting on steel and concrete. 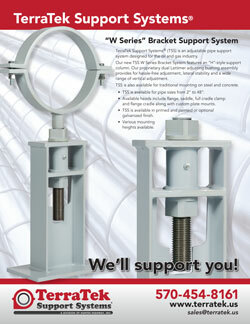 Pipe support brackets & clamps custom designed for pipe sizes 2 to 48 inches. Various oil & gas applications and other mechanical piping systems. TerraTek Field Services is a Pennsylvania-based company located in the Marcellus Shale gas deposit region, providing services to Eastern and Central United States. The TerraTek team is experienced in helping the oil and gas industries, especially throughout the Marcellus Shale natural gas region.